Foisy, Paul. "Alexander Wilson". The Canadian Encyclopedia, 11 July 2016, Historica Canada. https://www.thecanadianencyclopedia.ca/en/article/alexander-wilson. Accessed 25 April 2019. Alexander Sheldon Wilson (born at Montréal, Que 1 Dec 1907; died at Hidalgo, Tex 9 Dec 1994). Alex Wilson was a sprinter who wore the Canadian colours in the 1928 and 1932 Summer Olympics in track and field. Alex Wilson, an athlete for the Montreal Amateur Athletic Association, first gained renown on the Canadian scene in July 1928. During his tryouts for the Amsterdam Olympics, the Montréal runner won second place in the 400 metres and third place in the 800 metres, results that allowed him to participate in his first Olympic Games a few weeks later. Along with Phil Edwards, James Ball and Stanley Glover, he won the bronze medal in the 4 x 400 metres. The following autumn, the sprinter headed to the United States to pursue studies at the University of Notre Dame in South Bend, Indiana, where he quickly became a star athlete. In February 1929, he took part in the Millrose Games, an indoor track and field meet at Madison Square Garden (New York, NY). He participated in the 600 yards and stood out in the medley relay while his team of Phil Edwards, Percy Williams and James Ball won the gold medal. Wilson continued his progress and again earned fame in Toronto in July 1930 by running 500 yards in 57 seconds. In this event he cleared the quarter mile in less than 50 seconds, becoming one of three Canadians at the time to achieve this feat. At the Canadian championships several weeks later, he won gold in the 440 yards and was selected for the Commonwealth Games. At this international competition that united the countries of the British Commonwealth, he won a gold medal in the 440 yards, a silver medal in the 4 X 440 yards, and a bronze in the 880 yards. In February 1931, he returned from Madison Square Garden where he had placed third in the 600 yard race. Twelve months later, on the threshold of what would be an exceptional year, he was eventually victorious in this category at these indoor games. Early in the summer of 1932, Wilson was considered a favourite for gold in the 400 and 800 metre races at the Los Angeles Olympics. But before this, he had to be chosen for the national team. At the Canadian championships on 15 and 16 July 1932, it was Wilson who took the Olympic oath for the athletes. At these championships he marked a new Canadian record, winning gold in the 400 metres, and beating Phil Edwards in the 800 metres. 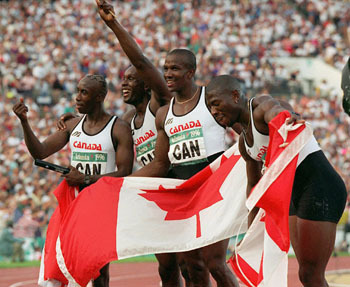 Wilson ended his career on a high note at the Los Angeles Olympics, mounting the podium three times: first in the 400 metres, where he beat the world record but had to be content with the bronze medal; next in the 800 metres where he again beat Edwards but finished in second place; and finally in the 4 x 400 metre relay, winning a bronze medal with his Canadian teammates. 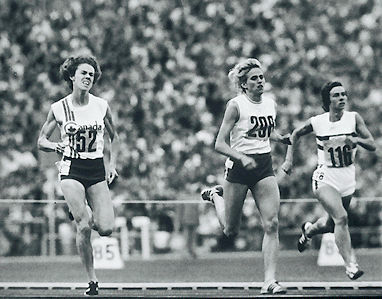 After the Los Angeles Olympics, Wilson rounded up his career without leaving the track and field arena. He passed on his experience and knowledge as a coach in athletics and swimming at Loyola University, Chicago, for 18 years. In 1950, he returned to his alma mater to assume the role of track and field coach until 1973. During his time at Notre Dame, his athletes and teams were successful across the USA both on the track and in cross-country competitions. Wilson's outstanding career garnered recognition from his peers. He was inducted into the Athletics Canada Hall of Fame in 1954. For his contribution as an American coach, he was elected to the Helms Athletic Foundation Hall of Fame in 1967. Five years later, he was named coach of the year by the NCAA Cross Country Coaches Association. Finally, in 2008, the US Track and Field and Cross Country Coaches Association Hall of Fame opened its doors to him. To honour his memory, the University of Notre Dame has organized an annual track and field meet bearing his name.